Integral Memory has announced the launch of its Crypto solid state drives (SSDs) that feature military-level, AES (Advanced Encryption Standard) 256-bit hardware encryption. The new drives will offer all the amenities of solid-state storage while protecting sensitive data in a secure, convenient and cost-effective manner. The military grade hardware runs silently and features fast boot times, low power operating and with no moving parts the SSDs are more resistant to shock and vibration. 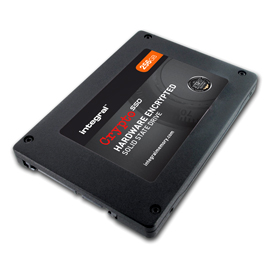 Integral’s Crypto SSDs will store everything on one drive— data and operating system included. The high-speed SSDs can easily be fitted to laptops and desktop PCs in minutes and use full disk encryption (FDE) to offer a higher level of security than software-only encryption. The Crypto SSDs also feature a multi-lingual interface that will facilitate global deployment. Following federal and state regulations, the protection of sensitive data is quickly becoming a mandatory function for many organizations— especially with regard to medical and financial records. For some, having everything in one place may seem precarious, for this reason the Crypto SSD security system is BIOS-independent with the disk and Windows boot-up accessible only by entering the correct high-strength 8-16 character alphanumeric password. If a fraudulent user exhausts the number of attempted passwords, the encrypted data is automatically erased and both the data and encryption key are securely destroyed resetting the Crypto SSD. Security preferences can be altered to fit the user and the number of failed passwords can be set anywhere from 6 to 20. Additionally, the system allows for an optional master over-ride password to be created in the event the user forgets their password. Integral’s Crypto SSD drives are Microsoft Windows XP, Microsoft Windows Vista and Microsoft Windows 7 compatible and are available at Amazon.com or directly from Integral Memory USA. Prices for the SSDs vary depending on the memory capacity of the unit and start at $223.34 for 32GB of memory.